Poppy and Harry had two weddings, and I was lucky enough to be there to capture both days for this wonderful couple. Their first wedding was the legal ceremony, used to facilitate their second, much larger wedding. On the first weekend in August, Poppy and Harry held a small intimate wedding ceremony at the Malvern Registry Office, and invited a handful of their nearest and dearest friends and family. After the ceremony, we took a couple of formal family photos to remember the day, and took 20 minutes to take some images of the bride and groom, now legally married, in the grounds of the Registry Office and Malvern Winter Gardens. A week later, the big wedding took place. 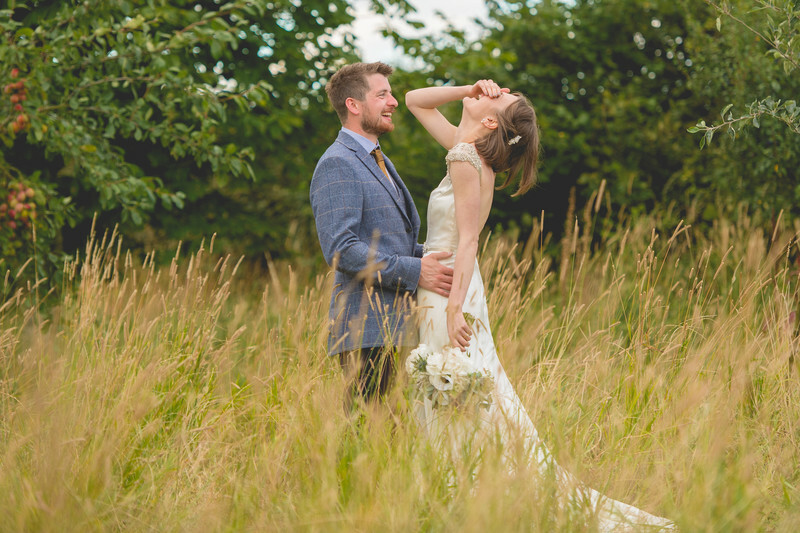 Poppy and Harry had always dreamed of getting married in a field under a large English Oak tree, and their search for this had led them to Rock Village Hall, not for the hall itself, but an adjoining field that featured perhaps the biggest oak tree I'd ever seen. The downside with a do-it-yourself wedding is that you have to do literally everything yourself. Set up the chairs outside, dress them, physically make something to get married under, dress the reception venue yourself and lots more, but that didn't put off this young couple. Harry, a dab hand with a hammer and nails set about making just about everything they could need for the wedding, including a beautiful set of rustic doors that would stand at the far end of the aisle, forming a focal point for the bride to walk through on her arrival. Rock Village Hall was a blank canvas for the wedding reception, with the couple making all of their own decorations. For catering, as the onsite kitchen was tiny and featured little more than a kettle and a microwave, the bride and groom had hired in a small catering van, specialising in French crepes, both savoury and sweet. The bar was provided in the form of vats of ice, filled with bottles of beer and cider, and the whole layout was what you might call a wedding festival instead of a traditional reception. This laid back approach to life was echoed in the couple themselves, and the pair never took themselves or the day too seriously. It was wonderful! The hardest part of my day was keeping the bride and groom from falling about laughing. Not that that didn't make for some wonderful photos, as you can see in the image at the top of this article. Poppy and Harry also bought their two dogs with them, which I couldn't help but include in some of the wedding photos. 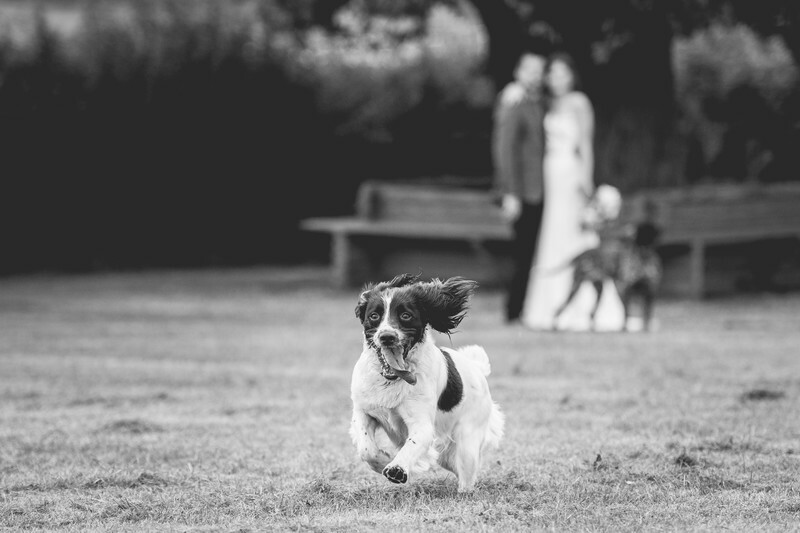 One of my favourites is this one below, showing their spaniel chasing after a ball that had been thrown past me by one of the wedding guests. I'm always happy to photograph dogs or owls or whatever it may be at a wedding, but there's always a risk that this becomes something other than a wedding photo. In order to keep this photo strictly topical, as soon as I saw the dog running towards me, I took a knee and made sure that I took photos as the dog was running past, but with the bride and groom in the background. Without the couple in the image, this photo could have been taken anywhere and at any time. With the bride and groom, this is 100% a wedding photo.